If a message or vehicle pictogram is being displayed, press button on the windscreen wiper level or the button on the multifunction steering wheel . 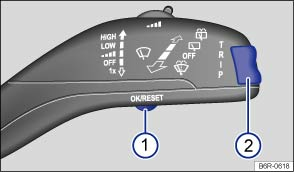 When operated using the windscreen wiper lever: press and hold the rocker switch to display the main menu or to return to the main menu from another menu. When operated using the multifunction steering wheel: the main menu is not listed. To navigate through the individual menu options, press the or button several times . Press the rocker switch on the windscreen wiper lever up or down, or press the arrow buttons or on the multifunction steering wheel until the required menu option is selected. The selected menu option is located between the two horizontal lines. There is also a triangle on the right-hand side: . 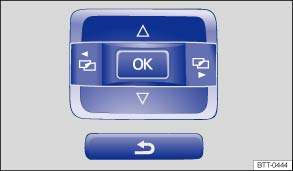 To open the submenu, press button on the windscreen wiper lever, or press the button on the multifunction steering wheel . Make any desired changes using the rocker switch on the windscreen wiper lever or the arrow buttons on the multifunction steering wheel. If necessary, press and hold the controls to increase or decrease the values quickly. Mark and confirm your selection by pressing the button on the windscreen wiper lever, or by pressing the button on the multifunction steering wheel. Within the menu: in the submenu, select the Back menu option to leave the submenu. When operated using the windscreen wiper lever: press and hold the rocker switch . When operated using the multifunction steering wheel: press the button .